Use the Home Learning Book or Contact Book to give feedback to the Class Teacher on how your child has tackled the activity. For example how long the task took and how enjoyable it was. Home Learning refers to any work or activity that pupils are asked to do outside lesson time, either on their own or with parents / carers. 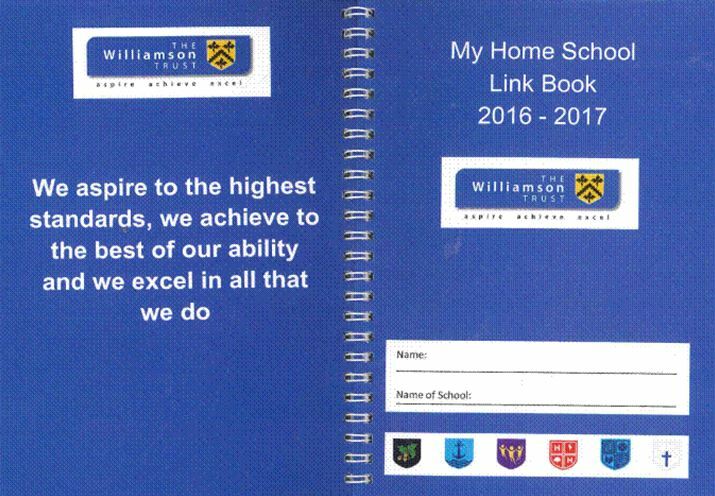 On their first day each child will be given a Home-Academy Link Book. This will be used as a reading record. Link books should be kept in a professional manner. The book will be looked at daily and comments added. Within the book there is home-school agreement to be signed by parent and pupil. Class teachers will also check over it and sign it each week, as will Year Heads from time to time. In this way, each child will know that we are all interested in their progress. There is a space for ‘Comments’ at the end of each week. This space may be used by each child’s Class teacher to send a message to parents, or parents may send a message into the Academy in the same way. At The Williamson Trust all Foundation Stage pupils have a home learning book. This includes a topic sheet with a range of home learnnig suggestions for pupils and parents to select weekly. In addition to this weekly phonics home learning is provided. This focuses on the sounds and words of the week. The phonic sounds and words will also be shared on Tapestry, to ensure all parents know how to pronounce the sounds correctly. Parents should hear their children read frequently (at least five days per week) and record any comments or observations in reading diaries. It is the expectation that class teachers will monitor the use of these diaries and support children in selecting appropriate home reading materials. Time should be made to discuss all aspects of the school curriculum. We encourage parents to ask children what they have ‘learned’ rather than what they ‘did’ during the school day and to support their child in developing a routine of completing and retuning homework within the expected timeframe given. Parents will be given termly Curriculum booklets which give further information on what children in each Year Group need to achieve and suggestions on how to support them. All school books should be kept in good condition. Work has to be shown to advisory teachers, inspectors and other schools. The school would like it to look good and reflect the child's true capabilities. Children will continue to bring reading books home. Parents still need to support children by hearing them read daily. To encourage reading for meaning children can summarise the story they have read, describe their favourite parts, discuss the main characters, predict what will happen next. All pupils will be asked to complete a termly project: ‘The Big Question’. The practice of termly home learning projects continues throughout the school and is in addition to English and Mathematics homework. Projects are designed to enable all pupils to achieve. Guidance on each project will be given to pupils and parents.